IT’S A PLEASURE to hear a new quartet release that’s bristling with such obvious vitality and ebullience! Danish bassist and composer Henrik Jensen presents a debut album of ten jazz originals, with compatriot Esben Tjalve at the piano, American trumpeter Andre Canniere and popular British drummer Peter Ibbetson. Andre Canniere is already known to audiences for his own driving jazz/rock fusion group, but here we discover his more acoustic persona with a technique which is clean and fluent, either at full throttle or when more reflective. 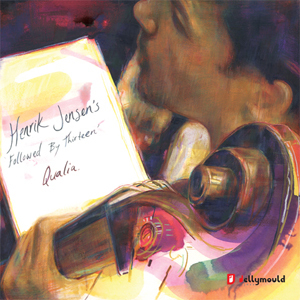 At times, his pairing with Jensen is reminiscent of American bassist/composer Ben Allison and trumpeter Ron Horton, though clearly both here express their own individual and appealing characteristics. Esben Tjalve has a beguiling pianistic style, the opening The Post Office inviting and delivering more than a hint of Thelonious Monk (perhaps even Ellington), courtesy of his fun, even brazen, melodic and improvisatory lead – a great, smile-raising lightness of touch. Pete Ibbetson displays a reliable sense of momentum here, similarly keeping things breezy with brushes and cymbals. The slower-paced The Milden Hall Museum (one of a number of tracks with intriguing, Google-prompting titles!) sees Tjalve and Jensen soloing skilfully around a memorable trumpet hook from Canniere. Dog of the Day returns the band to swing mode, all personnel evidently and brightly demonstrating their affinity with each other (as does Hep Hep, later on in the programme). And so the album continues, with delight after delight being conjured. A Wave Goodbye sets up an entrancing, slightly disquieting Avishai-like bass and drum groove – a great vehicle for Canniere and Tjalve to roam free, whilst also playing off each other very effectively. City Fox‘s lively pace is addictive (and over all too quickly! ), but then gives way to the quirky, twisting bassline of Landmarks where Tjalve and Canniere need no encouragement to follow suit with the freedom to explore, Ibbetson arrestingly and shimmeringly entertaining! Beautifully lyrical, Schmetteling reveals the quartet’s mastery of space, with Jensen soloing so eloquently; and finally, the moving, piano-led Mum Melody honours the album’s dedicatee, Henrik’s mother, and provides another opportunity for his bass to sing. The recording is favourably direct, with an almost ‘captured live’ feel, helping to make the connection between band and listener. Jellymould Jazz are building their relatively new catalogue with some fine albums, and it’s certainly worth bookmarking their website to keep an eye on their output with releases of this high calibre. Qualia – certainly distinctive in quality – is on general release from 29 July 2013, following a press launch of 18 July.